The first All African People’s Conference (AAPC) commemoration December 5-8, organized by the University of Ghana Legon was an intellectual gathering bringing together intellectuals and activists to expound on the “Unfinished Business” of the First AAPC. The conference cosponsored by Lincoln University, Socialist Forum Ghana, All African Labor Federation and the host (UAGL) explored six themes: Peoples of Africa; Neo-colonialism and Imperialism; African Union and Agenda 2063; Emancipation of Women; Reparations and Restorative Justice; Global Warming. The conference awakened a historical perspective of the AAPC to a new generation and debated the relevance of those deliverances today to the pan-African movement. The commemoration was great, very useful and worth attending. They assembled a truly pan-African grouping of young intellectuals, workers, activists, revolutionary organizers, progressive/revolutionary feminists and revolutionary/progressive scholars from across the continent and the African Diaspora. The mobilization effort was highlighted by the contingent from Burkina Faso who fought through obstacles but refused to turn back arriving on the third day. But as my elder comrade revolutionary Pan-Africanist of All-African People’s Revolutionary Party Guinea Conakry, Bob Brown said while receiving his Legacy award at the event, I paraphrase, the First AAPC only had 200 or so delegates but represented millions of people in political parties, liberation movements, trade unions, and peasant organizations across the continent. The First AAPC assembled Pan-African organizers from around the globe including Shirley DuBois. Imagine the theoretical architects and actual freedom fighters of the national liberation struggle assembled together to coordinate their energies against colonialism and settler-colonialism: Kwame Nkrumah, Franz Fanon, Patrice Lumumba. 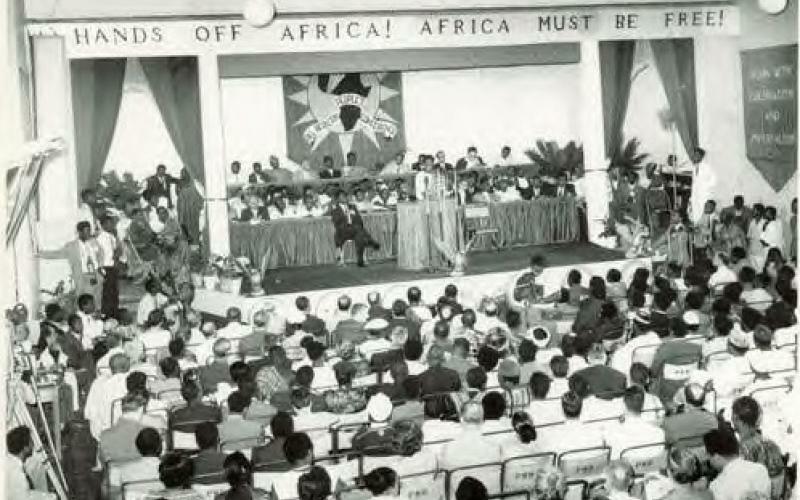 This was the first pan-African conference held on African soil. The first AAPC was followed by a second in 1960 and third in 1962. These were critical to defining and executing the liberation struggle across the continent. The December 5-8 commemoration of the first AAPC conference was good but was not an assembly of mass originations. The second AAPC commemoration opened December 8th. It was hosted by the Kwame Nkrumah Pan-African Centre but clearly organized by the Pan-African Federalist Movement. It was an examination and planning meeting for its members. Where all who attended were asked to participate in the discussions, they were centered around Pan-African Federalist Movement’s mission and program and not about building on the legacy of the All African People’s Conferences. As we revolutionaries examine the debate and direction inside the Pan-African movement we must make clear two distinctions about the commemorations here and the AAPCs. One is that neither commemoration was a continuation of the All African People’s Conferences. They never claimed to be. We clarify here because this work of building on the ideological and organizational development of the AAPCs and 5th Pan-African congress can only be done by a movement of the revolutionary Pan-African Parties and mass organizations of workers, women and youth committed to the people’s war to liberate Africa’s land, labor and resources under the banner of socialism. The second aspect of these conferences that must be highlighted is that there was healthy debate but no monolithic ideological or organizational agreement on the way forward. The ideological and organizational continuance of the All African People’s Conferences was represented by the All-African People’s Revolutionary Party, All African People’s Revolutionary Party (Guinee Conakry), Pan-African Revolutionary Socialist Party, and Nkrumahist/Tureist scholar/activists like Evelyn and Dr. Zizwe Poe, University of Ghana Professor Mjiba Frehiwot and Chy McGee at commemoration between December 5-8. There were contributions on the legacy of AAPC from the Socialist Forum, from labor, and a host of scholars left and progressive and revolutionary scholars. Several scholars made contributions to the relationship of gender to class and the role of youth too many to mention for the purposes of this article. But the conference again made no commitment to One Unified Socialist Africa. And leaving aside all those not committed to defeating capitalism and imperialism at the commemoration, there was the ever presence of the two-line struggle of the African Left https://aaprp-intl.org/socialism-in-africa-or-one-unified-socialist-africa-the-2-line-struggle-of-the-african-left/ . In fact, perhaps the best example of this struggle was illustrated by the continued attack on Zimbabwe’s land reclamation by some of the left forces in attendance almost parroting the attack of reactionary elements European left and ironically the racist settler population and their capitalist supporters like George Soros (Open Society Foundations). Starting with a paper lifted from the pages of the New York Times who never found a settler-colony or imperialist cause it didn’t support. This paper gave a one-sided discussion that left out the criminal economic sanctions imposed by U.S. and the E.U. as contributing factors to the country’s challenges at the time of the cholera outbreak. One has to ask–with all the cholera outbreaks in the South Africa region alone, including Azania/South Africa where privatization, not land reclamation led to massive deaths in the 2000s http://www.thehealthculture.com/2010/11/water-privatization-in-south-africa-prepaid-meters/ , and Africa where cholera and disease in general is a clear sign of the failure of neo-colonialism throughout the continent, why was Zimbabwe so viscously attacked? Our comrade Horace Campbell offered us the answer in his summation of the conference –he said it was a designed play to lead off the conference with an attack on Zimbabwe. Revolutionary Pan-Africanists know that land reclamation has to be at the core of the struggle to defeat neo-colonialism on the continent (http://wwpam.org/wp-content/uploads/2019/01/Reparationpaper-sobukwe2018.pdf) and Zimbabwe’s fast track land reclamation sparked by the people’s mass action is a sterling example of self-determined justice in the spirit of what Nkrumah called for at the AAPC and executed in Ghana. Nkrumah was clear that this action must be defended by a unified socialist continent, the masses of Africans globally and the anti-imperialist forces around the world. The second AAPC December 8-13 was challenged also around the ideological question of whether their movement was claiming the essence of the All African People’s Conferences. Many participants raised these questions to the current leadership of the Pan-African Federalist Movement (PAFM). Questions were raised around socialism, neo-colonial leadership and class struggle. The leadership of the movement said PAFM was not following the definition laid down by 5th PAC but was attempting to create a movement inclusive all Africans regardless of class. Revolutionary Pan-Africanists ask–is it possible to forge unity without honest class struggle against capitalism and neocolonialism in Africa? The truth be told, while revolutionaries must critique and protect the legacy of the African revolution, our bigger task is to bring about a truly revolutionary Pan-African gathering that moves forward the accomplishments of the 5th PAC and the All African People’s Conferences. The AAPRP is calling for building on the vision articulated by Kwame Nkrumah in the Handbook of Revolutionary Warfare which became 50 years old in 2018. Nkrumah published this book ten years after the first AAPC. The Handbook built on the experience of the coordination of armed political action and revolution theory in practice. Now we must organize together to add the accumulated experience of the African left in the last 50 years. From reflection to coordinated action. Forward to the African Revolution.